My maternal grandparents are always heavy on my mind this time of year. Thanksgiving was their holiday, the one they would host at their home. The women and kids would gather around the pool table while the men drank scotch and joked, making up rules to Billiards as ball after ball thudded into leather pockets. 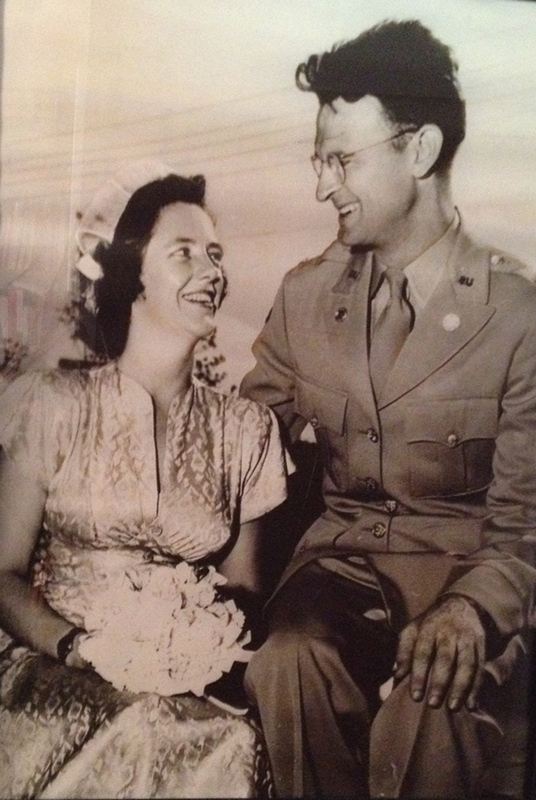 But Veterans Day has me recalling other stories involving my grandparents, stories about how and where they met. It was during World War II. They were in the Army and serving at Camp Patrick Henry in Warwick County, Virginia. My grandfather, John, was a transplanted California boy who’d grown up poor. My grandmother, Judy, was a native New Yorker, the daughter of an inventor, a child of privilege. She was also one of the few women at Patrick Henry to wear an officer’s stripes. Thus it was that they both attended a dance at the base Officer’s Club, John with a date, Judy footloose and fancy free… until she laid eyes on John for the first time and knew she would one day marry him. I love that story, not only because the bond that developed between my grandparents that night held strong nearly 60 years until their passing but, because the only images I have of them in wartime are happy ones. My immediate family is common in that many of us have served – including my father in the Navy, and brother in the Army – but we may be unusual in that none of our war stories include combat. That’s despite everyone’s having served during active military conflict. We have lost friends to war but no relatives. We are among the few who can make that claim. We know we are lucky. What I don’t know is how each individual felt about the fact that their destiny differed so radically from that of so many of their fellow service members. I am certain, however, that each was proud to serve this country and, having signed the proverbial blank check to the government, emerged awed and grateful at not being called to pay. My grandparents went on to mindfully immerse themselves in the life, liberty, and pursuit of happiness they’d been willing to defend, using their unique perspective and, yes, their love story, to teach younger generations the same message that arises from even the bloodiest of battle-tales: of the bonds between people, of the things that matter most. In honor of my grandparents, the aptly named John and Judy Veteran, and all others who offered – and offer – their life in service to this country, my deepest and eternal thanks.